Well, I didn't have my camera when I drove that way last week, but holy crap has it changed. Lots of work going on there, I tell ya. What is the final end product? You may not know this, but the City of Edmonton puts out diagrams and artist renditions for all ongoing construction projects. For the "137 Avenue Widening" as its officially known, it will ultimately look something like this. The plan includes widening 137th avenue all the way to 156th street. 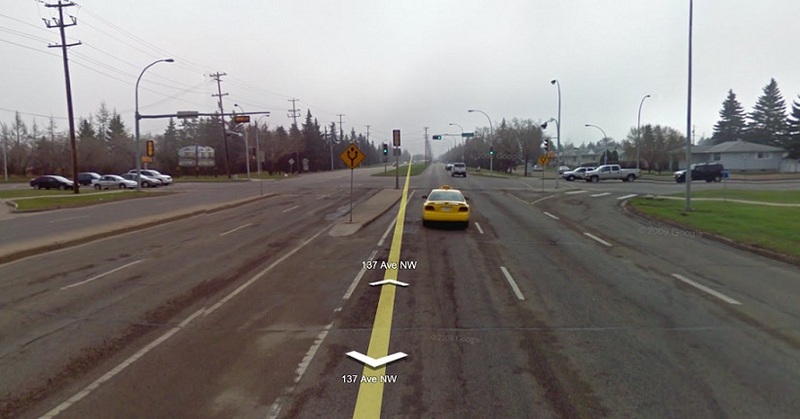 As a sidebar, last year I was tempted to blog about this topic already, since I noticed there was no talk of putting an overpass at the intersection of 137 Avenue and St. Albert Trail. As typically happens, the city will spend a bunch of money on this road, only to rip it all out in 5-10 years and build the overpass they should have built the entire time. Most seriously, they let a car dealership build on the southwest corner of the intersection, making it more difficult and expensive to build the stack interchanges needed. However, using only two corners of the intersection, it would still be possible. Still, the City is foolishly building all around that area (with the resulting congestion issues) without having a great finished product by the end. Anyways, back to the original issue: the widening is also combined with an underpass, to allow 137th Avenue to go underneath the railroad tracks. Now I have a coworker who lives up in north Edmonton and therefore she uses 137th daily in her commute. She reports that the train does occasionally interfere with rush hour, usually in the afternoon: sometimes for as long as 10 minutes. Lets say the train goes by five times a day (she thinks thats far too high, but bear with me). The time lag isn't a big issue as much as the traffic disruption of stopping flow and backlogging in all directions (including, you may note, the if-only-it-was cloverleaf interchange over at St. Albert Trail). This disruption happens less than five times a day. Hey, does anybody remember what happened when they built the LRT along 111th street just a couple months ago? Again, Google Street View can show you this view: Notice something about this intersection at 51st Avenue and 111th Street? Nobody who uses 111th for their commute can fail to notice that there's a level grade there. 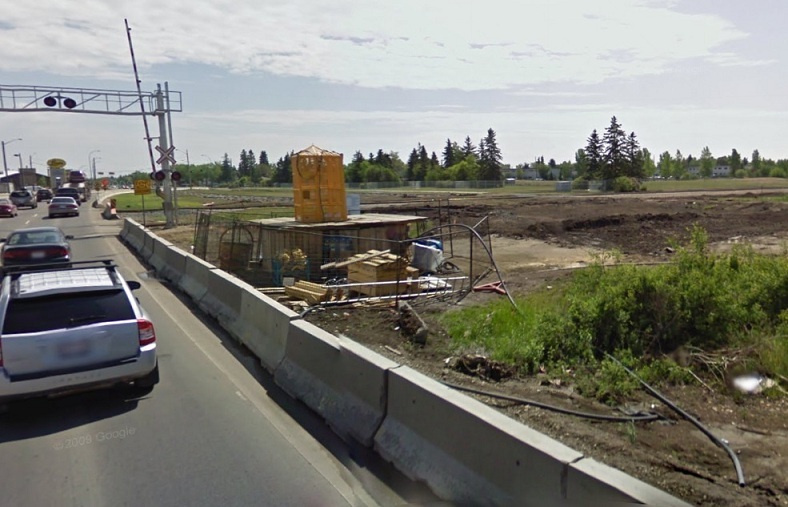 The City of Edmonton just spent sixty-three bazillion dollars building the south LRT line. LRT trains aren't a long as the ones that freight crossings endure to be sure, but every time the LRT comes by there is a a lengthy break in traffic flow. I said above that 5 times a day is pushing it for the 137th Ave crossing: well the LRT during rush hour comes by five times every half hour. So the same moronic City of Edmonton that spends the defense budget of several nations building an underpass for a train that passes a half dozen times a day also builds an above ground LRT line that will interfere with traffic ONE HUNDRED AND FIFTY TIMES A DAY† -- assuming that the north and south trains cross at exactly the same time. † This is not, in fact, a made up number. Southgate station receives exactly 150 southbound trains per weekday, and another 150 northbound trains. One way to think about this is that opening LRT is like building a six-lane freeway in terms of its capacity to move people, so when you’re crossing 111 Street in a sense it’s like crossing the equivalent of a 10-12 lane road. Many have contacted me to ask why the major intersections were not tunneled under or bridged over, and the decision was made during the planning phase based on computer modeling of each intersection. Each grade separation costs millions to implement, and cause more serious disruption so they are used very sparingly. Other citizens have asked whether the experience at these intersections will change the city’s intentions to run the new southeast-to-west line on the surface, including through downtown. This is a fair question that we will have to explore. The initial plans involve limiting many of the left turns, which wasn’t done on the South LRT. The first thing that should strike your attention is that Iveson apparently has never seen a freeway before. The salient point about them is that they are elevated or sunken and therefore cause no disruption to traffic moving perpendicular to them. I understand that somebody who thinks the Yellowhead is a freeway can be confused by this, but if we really built a 6-lane freeway to replace the LRT along 111th street, we the commuters of Edmonton would actually appreciate it. Hey Don, why not tear down your stupid train and build one of those! The other thing about freeways is that the intersecting roads are all useful additions to the vehicles that will travel on them. A freeway driver doesn't mind having 34th Ave and Whitemud Drive and 51st Ave and Argyll Road there, since he might be turning off onto one of them. No so with the LRT. The cost argument is truly laughable. Remember that eventually they will end up having to redesign the area roadways to compensate for the stupid decision they made in 2008. I remind future citizens of Edmonton that Iveson will not pay out of pocket for these stupid decisions: unless you force him to with some sort of retroactively personally culpable legislation. I strongly encourage this to all surviving Edmontonians in 2045 who aren't recovering from their stab wounds: especially when you realize that idiot Iveson's defense of the next LRT phase is that they will get rid of left turns entirely. Wait, isn't this the guy all up in arms about our carbon footprints? And now we're going to wind up with big stretches of traffic-jammed roads where you aren't able to cross the LRT track in order to start going West when you wanted to be going East. Bad enough this occurs on the Henday at the 111th street abortion overpass, but this is an area where people are trying to get around in: at least, that's the ultimate desire of the local business population. Will the City of Edmonton be putting a level grade for the LRT in this space? We don't yet know how often the trains will be running, but we can guess it will happen more often than the five (or less) times a freight train crosses this exact same road exactly two miles away. The train delays that Edmonton decided were worth creating an underpass for. 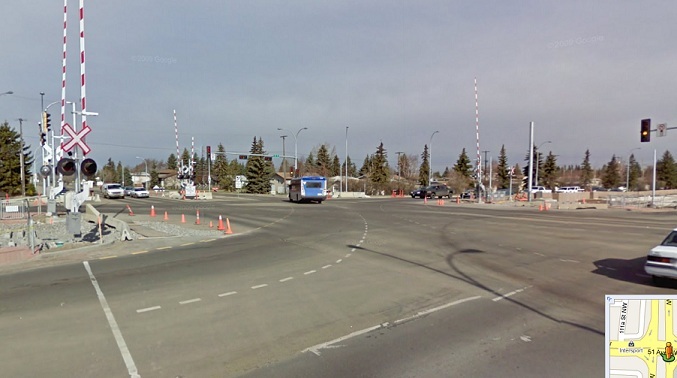 Anybody in Edmonton who is looking forward to missing the occasional train on 137th Avenue shouldn't be getting too excited: in 5 years, the braintrust at Edmonton City Council will be making you wait at 113th Street a hundred or so times. Oh, and the braintrust at the Legislature will tell you that you can't phone work to tell them you'll be late while stuck behind the trains. More on this later.